It is with much sadness that I have to report that John Stancer died last night, 16th May 2012. John was a much loved member of the Poacher's Section, rarely missing a meeting or summer run until he was taken ill last year. 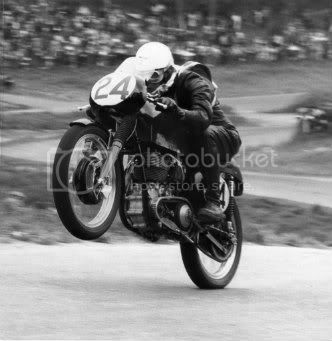 Here's John as many remember him, cresting the Mountain at Cadwell in the early sixties. Details of funeral arrangements will be posted when known. My deepest symphathies to family & friends. Just like to add to Robs Posting . Soon the end of our journey will loom near . Insured with Peter James . John's funeral will be on Friday, 1st June at Alford, Cremetorium at 2pm. Family only flowers, donations to the Stroke Association.